The view outside the window all the way through Peru had been an endless expanse of barren scrub interrupted only by the occasional ten-foot pile of garbage. In Ecuador, it was suddenly absolutely beautiful, mile after mile of green rolling hills, craggy mountains and spetacular canyons. In June 2003, while sitting outside a Dairy Queen in a Philadelphia suburb, a girl named Jessica asked a boy named Tim to travel the world with her. Neither had traveled much, if any, internationally before, but a dream was born on that warm summer day. And so it was in March 2005, after nearly two years of planning and saving, they stepped on a plane together with one-way tickets to Buenos Aires, Argentina. 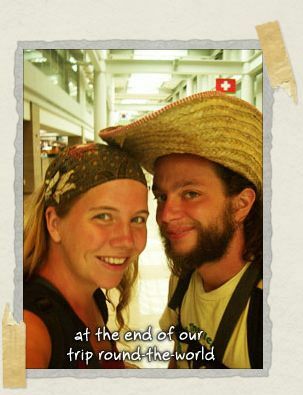 This website is the story of that couple and the adventures they had during their eighteen month round-the-world trip and the travels they've had since returning home. It's the tale of the people they've met, the experiences that have touched them, and the beauty they have witnessed. It is the documentation of dreams pursued and dreams realized. And it is their story of love: their love of travel, their love of exploration, their love of the little things, and above all else, their love for one another. If you had told me at the beginning of November 2002 that a mere five years later I would have traveled the world several times over, adopted a dog from Thailand, and eventually live in a converted fishing shack on the shores of Cape Cod, I never would have believed you. And I certainly wouldn't have believed you if you said I'd also fall in love with a boy who is all the pieces to my puzzle. As it turns out, though, you would have been right. I met the boy, Tim, in mid-November 2002 at a gathering of some aspiring local writers in Philadelphia. Specifically, at a gathering of NaNoWriMo (National Novel Writing Month) participants. Looking back it's incredibly fitting that Tim and I met there. NaNoWriMo encourages people to accomplish a dream – in this case, to write a novel in the month of November. It asks participants to grab with both hands that very thing many people will say "maybe one day" about. And as it turned out, Tim and I are very good at never saying "maybe one day" about the dreams we share. The idea for our trip around the world was born out of a bit of boredom, a fair share of frustration, and a large desire to do something. I had been working successfully in the non-profit world for several years, since graduating from Haverford College in 1999. Tim had been working successfully in the design world for even longer, having graduated from the Art Institute of Pittsburgh in 1997. Neither of us were unhappy with our jobs, but both of us had begun to feel life was passing us by. Traveling internationally was something each of us wanted to do, but we had always assumed even shorter trips to Europe were for other people; in other words, people who had means. And so it was on that summer's evening in June 2003 that we stopped assuming. Instead, we started dreaming. Having only met seven months earlier, Tim and I spent nearly two years planning and plotting, saving and studying for our upcoming trip. 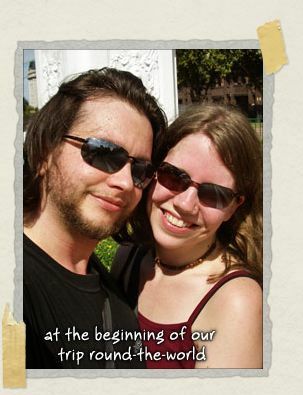 Our original plan was to stay in one country for several months, working in a restaurant and renting a cheap flat. That quickly changed to traveling to various countries for 3 months. Then 3 months turned to 6 months. And just a few weeks prior to our departure in March 2005, 6 months turned to 12 months. Of course, when we hit the road, 12 months turned to 18 months. Our original itinerary with its ambitious plan to tackle 22 countries was quickly whittled down to 12 countries as we discovered we enjoy traveling slowly. Major tourist sites aside, our ideal day of travel involves people watching while snacking on food from a road cart, exploring outlying villages or the back streets in cities, and soaking up life in another land. While traveling we accumulated over 30,000 photos, three diaries with daily notes, over 100 stories on this website journaling our adventures, and thousands upon thousands of memories. Along the way, we got engaged too. Eighteen months later, it was time for our trip to end and time for us to return to the working world. Instead of settling back in our beloved Philadelphia, we moved into a tiny Capitol Hill apartment in Washington, D.C. Tim took up telecommuting to his really awesome job based in Philadelphia, and I started applying to graduate schools for Master's Degree programs in Political Science. In the meantime, we also returned to Southeast Asia to adopt our dog, Belly, from the jungles of northern Thailand where he lived at an elephant sanctuary. A month before the acceptance letters from graduate schools arrived, I realized I didn't want to go to graduate school after all. In fact, we both realized we didn't want to live in Washington, DC at all. Our trip, it seemed, had changed us in more ways than we imagined, including making us no longer the city people we once were. A few short months later, after daydreaming and planning, we moved to our favorite place in the United States: Cape Cod. Adjusting to living outside of the city and on the coast has taken its time, but the stark beauty of the Cape makes it well worth it. Meanwhile, our jungle dog has taken a liking to the ocean even when it snows. We got married on the beach in Cape Cod. We continue to dream. And we have continued to record the stories from our round-the-world trip here, as well as the tips and tricks we learned along the way. It goes without saying, after traveling for 18 months around the world, we have "the travel bug." And so as we continue to travel internationally each year, we enjoy sharing those stories here as well. Throughout all of these pages, you'll find our impressions about different countries, our lessons learned while traveling, and our approach to backpacking around the world. And you'll also find a fair bit of hope. Specifically, our hope that by sharing these stories that perhaps, just perhaps, we'll inspire others to no longer say "maybe one day" too. So glad you guys are back! Love to follow your travels – Keep it up. Thanks, Jackie! It's great to hear from you again! We are so excited we cannot sleep! We'll see you guys 2 PM Friday at the airport. We love you! Your timing for this comment is perfect! I just left you a comment saying the same thing on the "Travel Pushers" entry. We are definitely sisters! 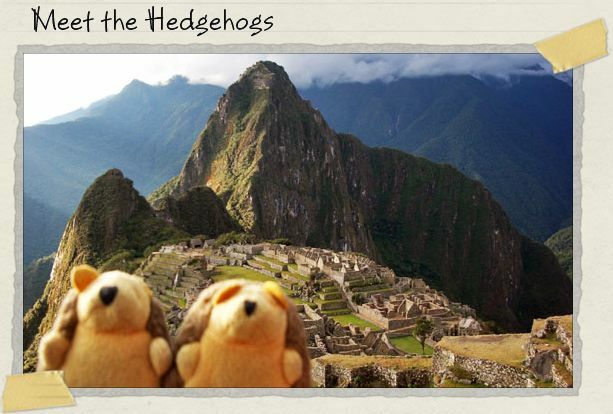 Thanks for sharing all your wonderful travel adventures, Tim and Jessica! They're beautiful and inspiring. We should all follow our dream, whatever they may be! We should all follow our dream, whatever they may be! I'm happy for you guys! Thanks for sharing your stories. anyway, congrats, if you did it. it's really lovely. just wondering how much you charge for a video like that and what does the service include? Thanks for your sharing and your website is very beautiful and well built ! Hi Amy! Thank you so much for your kind words about the website. That's amazing that you've been to over 30 countries! You have some really stunning photos on your website. Have a wonderful time in Argentina! It's one of our most favorite countries in the world. Hey! I didn't realize all this time that you had a kickass website: awesome! It's officially been added to my reader, and I'm excited to read back over your entries. Happy Travels! Hey Blair! Awww, thanks for the compliments on our blog! I'm so glad you're enjoying it. I love your blog too – it's one of my absolute favorites! what a great bit of reading and design i stumbled upon – well done, and hope you have many more trips so you keep adding to the site! You likely have never heard this one… but you all are living my dream. hahaha Not one of my most original statements but is the most accurate. Enjoyed the writing but the web site design blew my mind! Great job, so jealous… maybe you could sell it to wordpress? Actually found you following a post breadcrumb trail about the Elephant Nature Park, which I will be volunteering at in Jan/13. Anyway thanks for the inspirations. Eugene – Thank you so much for your kind comment! You really made our day! And no worries, we absolutely plan to have many more trips…in fact we have another one coming up in just a little bit. Yay! Donnae – Thanks so much for the compliments! And we're so happy to hear that you'll be visiting the Park in January of next year. It's one of our favorite places in the world – absolutely magical! You'll have a grand time there. Happy travels! Long time no see, Tim! Glad to see you are living the dream.